In Life Underground, the player drives a rover / mobile laboratory down a mine to the Earth’s crust and conducts research on microorganisms living in extreme environments. Players navigate the mine as Chloe Martinez, a PhD candidate in biochemistry. Assisting her over the phone are her advisor and his two scientist colleagues, who are respectively specialised in geochemistry, biophysics, and geobiology. Inside the rover, meters offer interesting information on the current environment: The pH level, temperature, and depth all change as we get closer to the Earth’s crust. Passing through extreme environments (cold, hot, acidic, alkaline, and so forth), the player collects samples of microorganisms and conducts experiments to learn more about these “extremophiles.” These experiments include exposing each “isolate” (a sample of a single kind of microorganism) to different chemical materials, like ammonium and sulfate, and seeing how it reacts. As the player progresses, they are reminded that asking a question, formulating a hypothesis, and testing it through experimentation constitute steps of the scientific method. Concepts such as “archaea,” “extreme environment,” and “substrate,” as well as a good number of microorganisms—heterotrophs, halophiles, thermophiles, etc.—are clearly explained, thanks to the three scientists advising you. 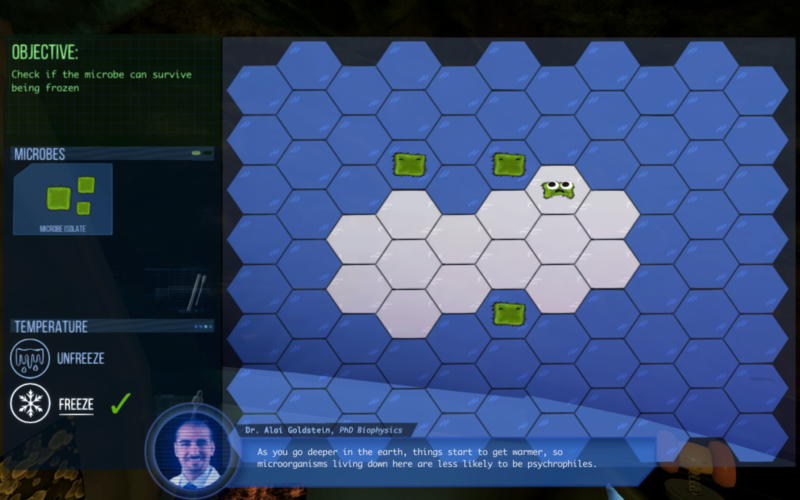 Every time a scientific term is used, its description is shown on the screen and added to the player’s “field notes,” forming a glossary of comprehensible entries. Life Underground is not an exploration game, but rather a narrative that progresses linearly: The microorganisms uncovered and the hypotheses tested are predetermined by the story. Players press the spacebar to “drive” the rover, but they don’t control where it goes or when it stops. They will feel more involved when the time comes to experiment, as they’ll drag their mouse to drop the sample on the slide and to manipulate environmental factors. But again, the objective of each experiment is decided in advance by the game, and there are no puzzles. Thankfully, the characters and their discussions are engaging and draw the player in. Other negative points are that the player cannot interact with the game during dialogues. The ability to fast forward or rewind to replay something that was said would have been useful. 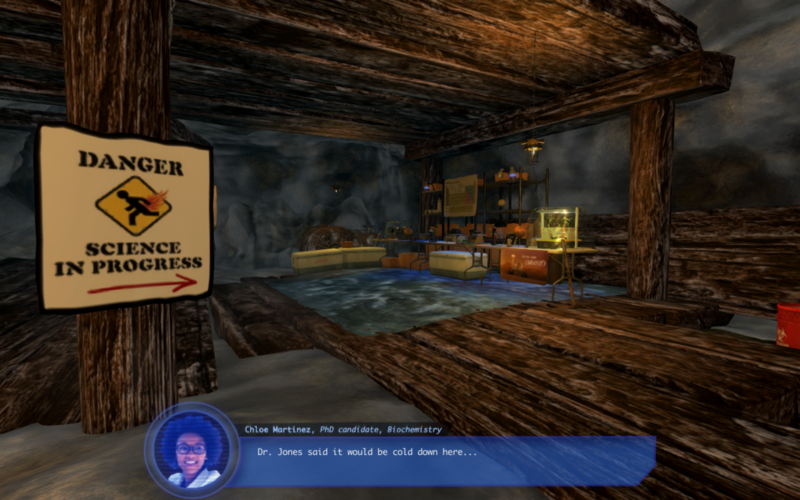 Life Underground, intended for students in grades 7 and 8, has three main objectives identified in the game’s curriculum proposal: exemplify the scientific method, introduce the idea that life exists at a different scale than what’s conducive to human life, and expose students to STEM career paths. The game constitutes a good basis to have students reflect on what is required for a scientific investigation. Moreover, it succeeds in explaining how life is much more complex than what the eye can see and shows how harsh or “extreme” environments—on Earth or elsewhere—could actually host life. As someone who hasn’t been in a science class in over 15 years, I thought the game did a great job of simplifying its subject and making it accessible for middle school students. Available on Windows, Mac, and Linux, Life Underground is free, but the developer accepts donations. It comes with a curriculum proposal comprising a lab exercise and four classroom activities—each related to one of the four characters and their specific field. One of those activities is a personality-career quiz to help students determine which STEM field would best suit their interests. Life Underground offers a linear story with engaging characters and comprehensible explanations of concepts related to science and biology.